Epic’s passion for modding has been a core part of our DNA for decades. In fact, a significant number of our employees got their industry start in the mod community by bringing their ideas to life on the solid foundation of a great game. 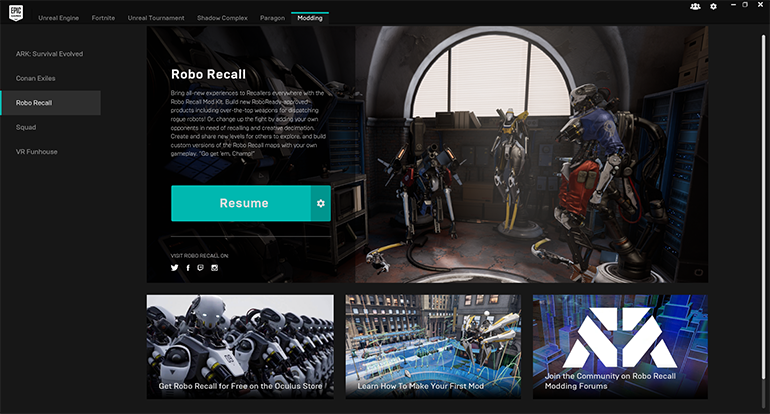 In that spirit, we’re proud to make all the assets and source code for Robo Recall available to everyone via the Robo Recall Mod Kit, available now via the Epic Games launcher. Leveraging the workflows and power of Unreal Engine 4, new weapons, enemies, maps and other content of all kinds can be made and loaded up into the VR title. With the Robo Recall Mod Kit, modders can make new gameplay assets that allow players to fight dinosaurs instead of robots or use space weapons in the place of their standard weapon loadout. Want to take the Robo Recall experience to all new locales? That’s possible, too! Learn how to get started with Robo Recall modding here. UPDATE: You can now watch the "Building Robo Recall Mods with Blueprints" tutorial video below.